when call-up took him eventually to Ceylon. I don’t remember any of our friends’ fathers going away, probably as they were connected with agriculture or vital trades in the village. My mother worked on the land and was also a member of the Black and White concert party which gave entertainments. cons. However, Mum wasn’t the sort to moan and before long she was carrying waste water in a bucket out across the road to a ditch; or carrying in a tin bath once a week (boiling the water in a saucepan to fill it, then emptying it all again); regularly blackleading the range with Zebra polish, trimming oil lamps (I have one of them still), lighting the copper at the bottom of the garden and carrying all the water down there for wash day; and perhaps the worst chore of all in modern eyes, digging holes in the garden for the contents of the privy. All were an accepted way of life. 24 years later there was still no main drainage, sanitation or hot water. Recalling all these regular routines (we didn’t have electricity until I was 10 and when I finally moved away 24 years later there was still no main drainage, sanitation or hot water) certain loves and dislikes come to mind. Low ceilings and oil lamps combine to give warmth and a lovely soft light but one’s clothes always smelt of paraffin (this was only eclipsed when the house beams were re-creosoted when for weeks, or so it seemed, everything smelt and tasted of the oily black liquid!). Being the youngest often brought the privilege of first bath and clean water – ironic this, I was probably often the dirtiest as much of my young days were spent playing outside in mud or dust depending on the weather. Years on, this became more of a privilege one had to fight for (or be good for). I have even now very clear memories of being sat on a cupboard top for my legs to have their daily scrub with red carbolic soap – I still hate the smell. Visitors (mainly from towns and cities) could never get used to no drainage and invariably, despite warnings, would let the waste water bucket overflow on their feet. 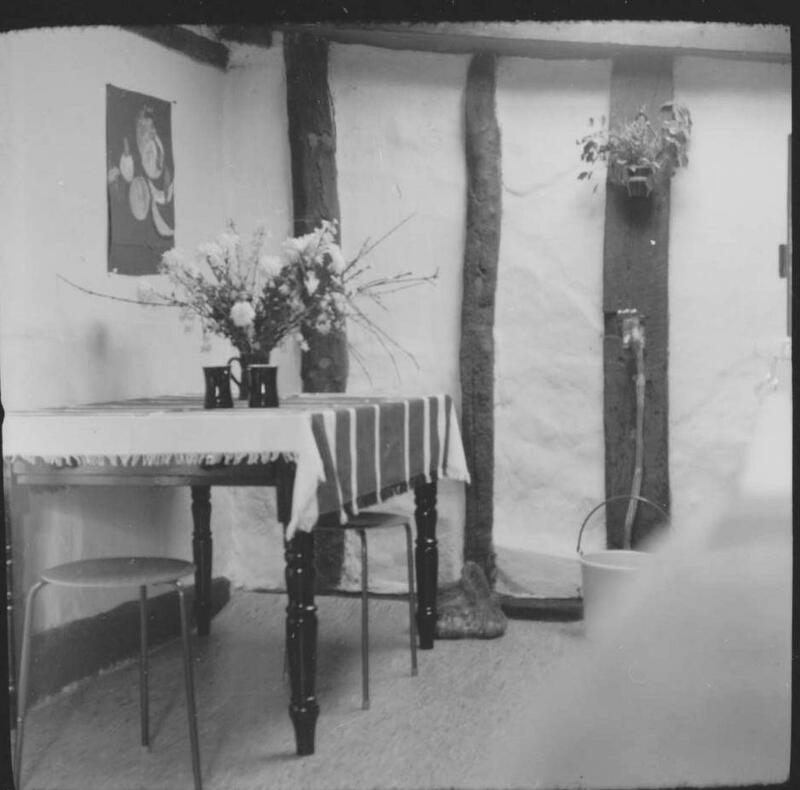 The kitchen in 1960. Just a tap and a bucket! Try carrying a brimming bucket through two rooms, down a steep step and cross the road without getting your feet wet yet again. 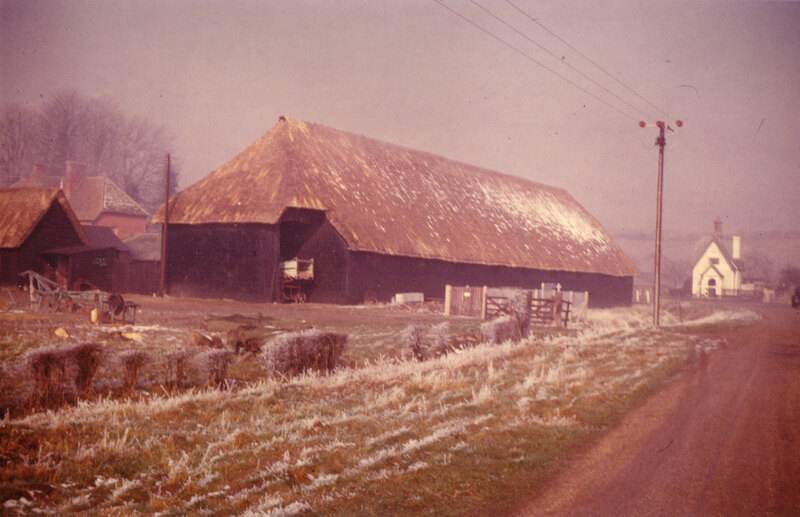 Wash-day had fun elements for me as a fire in the copper made playing in the barn cosier and there was always the washing to poke with the long wooden copper stick. Helping to turn the handle of the huge old iron mangle with its wooden rollers and watching the water stream out into the bucket below was exciting. Small items were rolled right through; larger, such as sheets, were rolled one way and then reversed back through. It must have all been really hard work and modern families who gasp in horror to think of clothes being changed only once a week might think differently if they spent a day washing heavy non-drip-dry clothes and bedding in a copper at the bottom of the garden! Wet days of course brought added cares and though we children thought chasing in and out of sheets strung across the living room a good diversion, I’m sure my mother didn’t. Some of the older men were still smoking clay pipes in my toddling days and Billy Pearce was one of them. The pain of inhaling on the one I found left unattended for some reason is with me still (certainly I have never smoked since) and I think must be one of my earliest memories. The ‘homely’ smells of those times belong to a by-gone age. Houses mingled wood smoke, baccy, paraffin, baking and onions into an aroma which permeated and became part of the pattern of our lives. 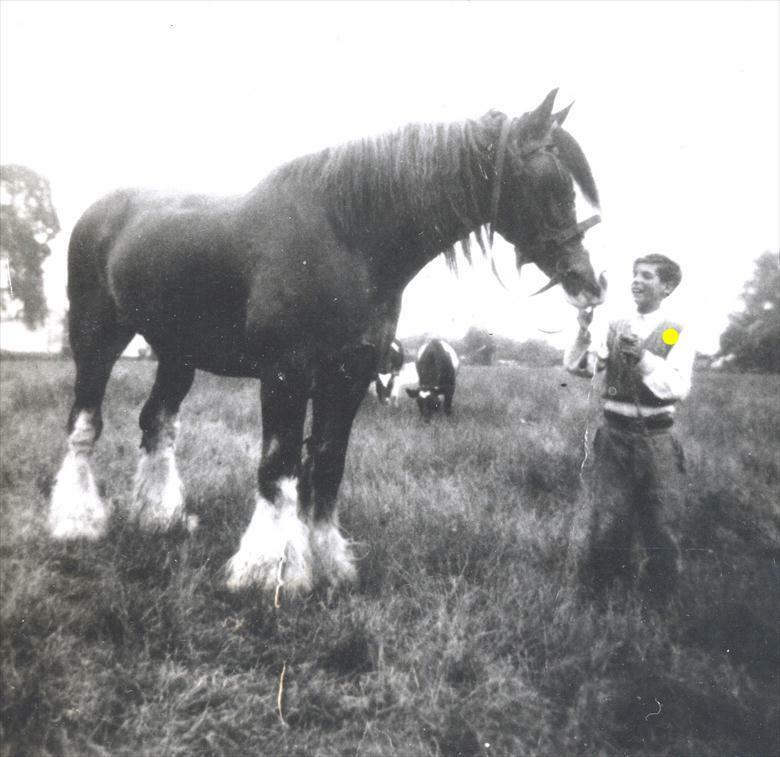 This was also a world in which horses were still important and though people now fondly talk with misty eyes of the gentle giants, I’m afraid I was terrified of the towering beasts, with their heavily fringed dinner plate size hoofs. Occasionally a pair would break out of the farm (Mr Parcels) in Stocks Lane and gallop round to see their friends at the farm at the foot of Leaden Hill. 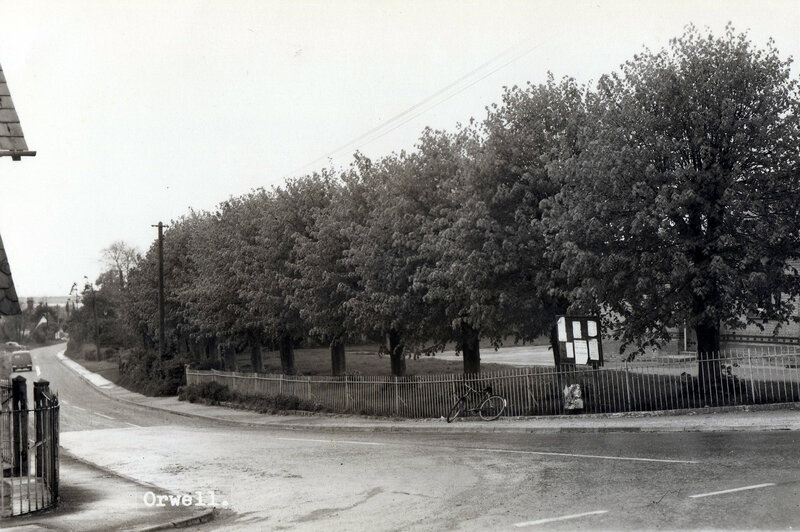 Stocks Lane in those days was very narrow and bounded by a ditch on one side and a bank on the other and if we were playing on the road (as we often were) the sound of horse hoofs approaching sent us flying for the comparative safety of a ditch or bank! I’m afraid even today I am not keen on being near a horse. the fear of fire was a constant dread especially after long hot spells. Lotfield House came to have happier memories for me, for it was eventually restored and became a beautiful home for Dr and Mrs Beatty. My mother did some cleaning for them and sometimes I went with her and Mrs Beatty showed me some of her lovely possessions. It was the first time I had seen a ‘Lazy Susan’ and I can remember wondering if I spun it very fast whether all the little dishes would fly off. Needless to say I didn’t dare try! A lot of the time I and other local children ran fairly wild, playing exciting games in the Clunch Pits and making forays further afield to the river and the plantation on the Barrington Road. The latter was a delightful source of violets, blue and white, by the thousand. For several years little Helen Ewer was one of my playmates when her family moved to the village from New Zealand. She was a pretty and gentle little girl who suffered badly from asthma. Once when we were playing in the fields by a bomb crater (Bassingbourn RAF meant Orwell was not without its share of bombs during the war). We children were sent into a panic by a strange ‘wheezing’ until we realized it was poor Helen, no doubt affected by the grasses. Her death from ‘Lock-jaw’ as it was known then, resulting from burning herself on a stove when still only a little girl, was my first realisation of the bitterness of death and one I have never forgotten (her memorial picture is still in the church). The village held other charms and excitements: playing in the ‘mash’ as we called it – now the council housing estate off Stocks Lane. Then it was allotments backed by a marshy meadow presumably where the word ‘mash’ came from. The brook in flood and tobogganing in the snow at the clunch pits were a bonus which no adults appeared to stop us from enjoying to the full, and somehow we all seemed to survive with no more than soakings and bruising. A daily chore I had to perform was fetching our milk from the Arnolds’ farm at the far end of the village – quite a long walk for small legs! 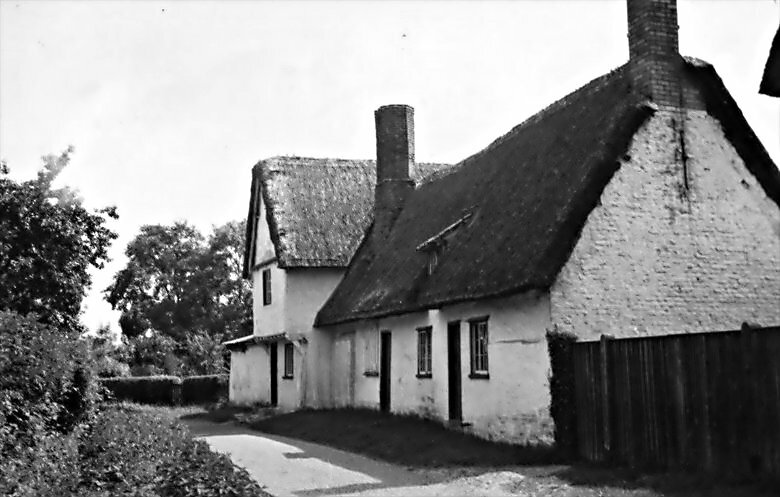 Known as West Farm, it was actually at the east end of the village (perhaps it was once in the parish of Barrington? ), run by Mr Arnold, a bachelor, and his spinster sister, they lived in the rambling red brick house. 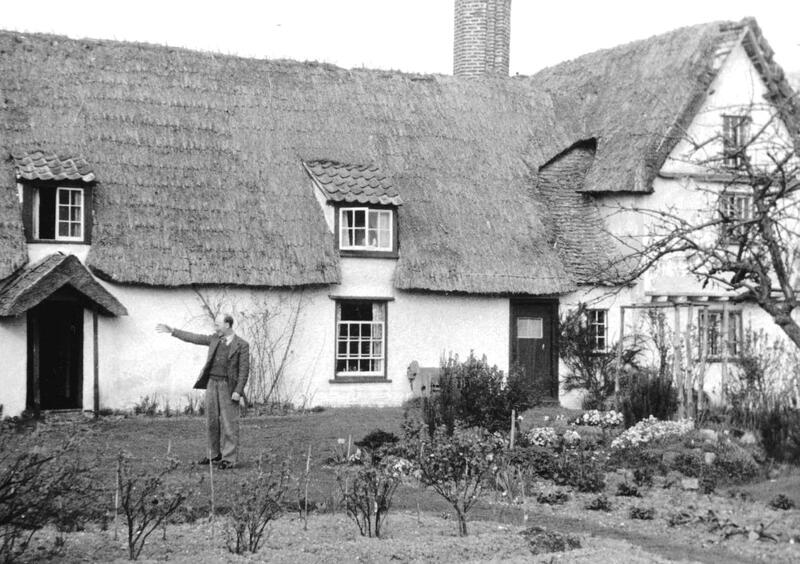 The younger brother ‘Alfie’ who was married, lived in a cottage across the road. When you entered the enclosure fenced off from the yard, cats would scatter in all directions – I’m sure I don’t exaggerate when I say there must have been 20+ at least. I remember the ‘milky’ smell of the kitchen and the cool dampness of the dairy where churns and large earthenware pans held the milk. We couldn’t afford a proper milk can, so I carried an ex-lemonade bottle back and forth, cold and slippery in bad weather and restricting in the summer when there was more to divert one’s attention on the journey home. The Arnolds were kind, quiet folk and Miss Arnold used to give me a ‘pat of butter’ with a pattern on it for my birthday. Near the farm was a large house lived in by a gentleman known as Johnnie Bull and we used to ‘dare’ each other to peep over his wall at statues of half naked ladies in his garden! I also fetched other items from Mrs Parcel (I think this may not be the right name but I cannot recall another) who ran the Post Office and our bread from Mr Howard, the baker, whose family were friends of ours. Sometimes I would eat holes out of the bottom of the loaf and hope my mother wouldn’t notice! 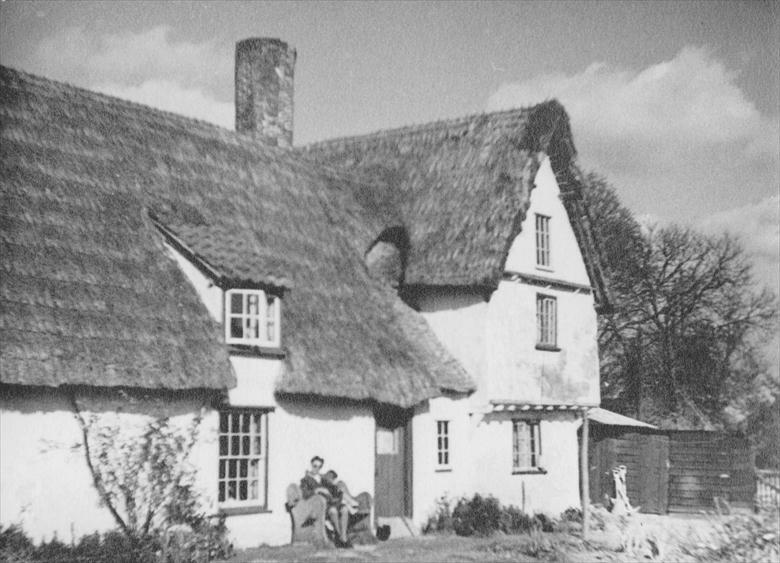 The Howards was a wonderful place to play: the bakery made the house lovely and warm, which was a luxury before central heating. Mr and Mrs Parcel, who kept the forge and had greenhouses dripping with delicious tomatoes and cucumbers in summer, were another kindly couple who always welcomed me on my errands. The Millers, who ran the grocery store nearest to us, were like another adopted ‘Uncle and Aunt’. ‘Huddlestones’ shop was further away and visited less often and seemed rather dark and severe with high polished wood counters. At one stage they also had a ‘furniture section’ and I know my Mother bought some of our bedroom furniture from there. However, strangely enough I think my favourite place to visit of earlier childhood was the tumble-down workshop of Mr 'Drew' Bullen who made coffins! He also was a wheelwright and general carpenter. As far as I can remember he was a small man and the workshop (which was near the Methodist Chapel) was ‘propped up’ with numerous poles! I cannot remember if he was particularly friendly towards us children but what I loved was the glorious smell of wood and the long curly shavings which I would beg to have handfuls of – often tangling them into my hair to make long ‘curls’! 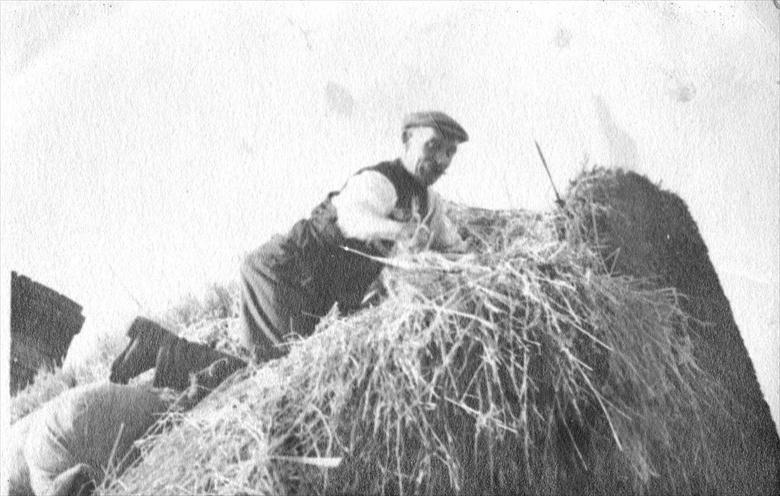 The ‘Thatcher’ was an occasional visitor to ours and I would watch as the father leisurely made the willow pegs whilst his son, I think called ‘Harry’, did most of the thatching. This pair also thatched the ‘ricks’ or straw sacks. The butcher’s had sawdust on the wooden floor which was marvellous for sliding about on whilst you waited or drew patterns in with your feet. The village was well provided with shops but one very important ‘travelling shop’ was Mr Brown’s (I think, of Burwell) which was a marvellous van bringing essential paraffin to a village with no electricity. The tank must have been underneath as I think there was a tap from which the cans were filled at the back. The van had inset sides which were hung with brooms, brushes and even tin baths. Inside were soap and cleaning materials. I loved it when he came and I could clamber inside to look around whilst my Mother was served. Later on the village gained ‘Wilshers’ garage down near the brook but mechanical things have never interested me so I remember little of it, though I think our first car, a Morris 8, came from it in approximately 1950. Certain village characters have stayed in my mind: Mr Lavender, the chimney sweep, tall and gaunt, who often wore a large hat with corks round it to keep away the flies and his housekeeper ‘Polly Isles’ who lived a few doors away. She always called me ‘my duck’ which I didn’t like. gloomy pictures on the walls of the dark little cottage. ‘Uncle’ spent his annual week’s holiday by cycling towards Barrington and spending the day in quiet contemplation before cycling home again. Mrs Mulberry lived in the council houses in Fisher’s Lane and I can never remember seeing her other than with an apron on and a beret on her head. She attended all weddings and funerals as a spectator thus clad – she was outside the church I remember when my sister was married in 1957 when life in the village was quite different from my early childhood. I loved the clunch pits and adored the elderly Mr and Mrs. Welch who lived in the farm at its foot. He, so gentle, was a child’s perfect companion, offering peace and security. Many a Sunday evening after church I walked or sat with him on the grassy knolls of the clunch pits looking out over the wide vista below us as his cattle munched contentedly nearby. Mrs Welch always wore a velvet neck choker which utterly fascinated me. There were others, some I have forgotten, but everyone knew you and you never gave safety a thought, even your tumbles and bumps out in the fields would be comforted by older children, either relatives or friends. However the life of total freedom came to an end for school beckoned. In my case I really didn’t mind too much. I loved school as well. The Council School was for the infants with two teachers – the Mrs Bakers; ‘thin’ Mrs Baker and Mrs Baker (you were too well mannered to say ‘plump’). Two things only stick in my mind of the first day: wondering why the alphabet was on the wall when I knew it already; and not liking the gloomy loos out in the yard which weren’t too sweet-smelling either. Otherwise I always enjoyed school and we had wonderful nature walks. We were kept warm by a pot-bellied stove fuelled by an enormous heap of coke in the playground which we were forbidden to play on. Disobedience usually resulted in cut knees To this day the sight of rush mats or the smell of lime trees in blossom takes me back to lessons held under the trees – still there – when the weather was very hot. Abandoned hastily once when a hornets' nest was discovered. When you reached Juniors’ age it was across the road to the Church School run by Mrs Maddox (who lived in the school house) assisted sometimes by Miss Snell who lived close by. 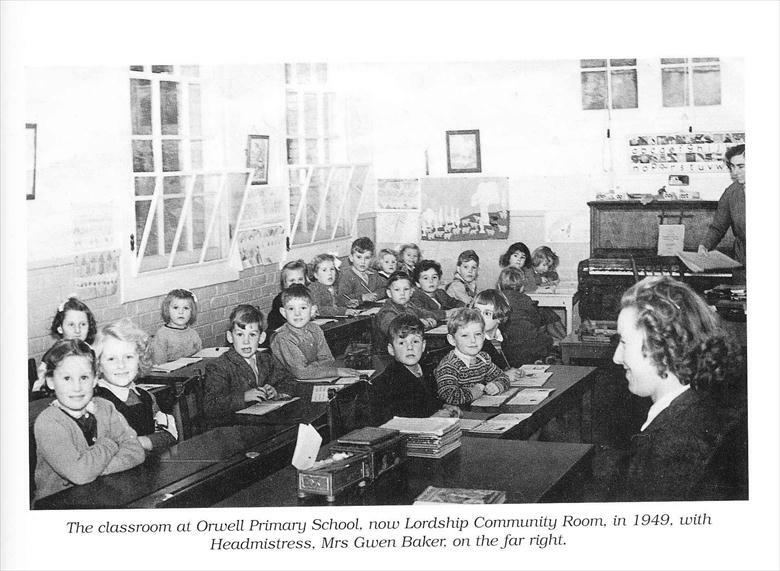 The building was darker than the Infants, with high leaded windows which you couldn’t see out of easily, but boredom could sometimes be relieved by tempting out from under the desk Mrs Maddox’s black spaniel which also came to school. A much smaller room of the main room was where we girls did needlework, which I hated and often pleaded to be allowed to do gardening with the boys; I cannot remember ever doing so, though. May Day was one of the highlights along with Easter and Christmas. We listened to BBC schools programmes and had lovely glossy booklets to accompany them. The large brown radios and their messy accumulators were still a magical possession. I am not quite sure when, but at some point a travelling film show used to come to the village hall which was also a great excitement though how we heard anything above the racket we made I cannot imagine. When I was about 10 (in 1950) electricity came to the village (the date is correct I think). It was amazing – so much light and when my Mother eventually had an electric cooker our wonder knew no bounds. A neighbour got a television – huge box, tiny screen – their sitting room jammed full for the Coronation. But though electricity brought much relief and comfort for parents and older people it was also the end of an era and I wish now I had taken more notice of a lifestyle which was soon to vanish for ever. At 10 I also got the scholarship which was to take me to school in Cambridge and though I was to be in the village for another 14 years the bonds were loosening. Traction engines and horses slipped away and farm machinery grew more mechanical though ‘spud bashing’ on a cold autumn day (for pocket money) was still hard graft for a teenager. The ‘bright lights’ didn’t tempt me as much as some and from a distance of some 35+ years Orwell still holds very special memories for me. This page was added by Pat Grigor on 22/10/2012.